Unlike its DriveAssist 50LMT cousin, the single-channel Garmin Dash Cam 35 produced excellent video in all lighting conditions. And its large (for a dash cam) 3-inch display makes it a bit easier to see what’s going on than the 2-inch types used in the Cobra CDR895D and Viofo A119. The thin, slightly stiff buttons and lack of onscreen hints for them made using the Dash Cam 35 a bit trickier than it was for the others. Sure, the buttons are only dual-function, but memorizing stuff we don’t use very often isn’t our favorite pastime. Need to snap a photo in a hurry? Hope you remember the proper button. 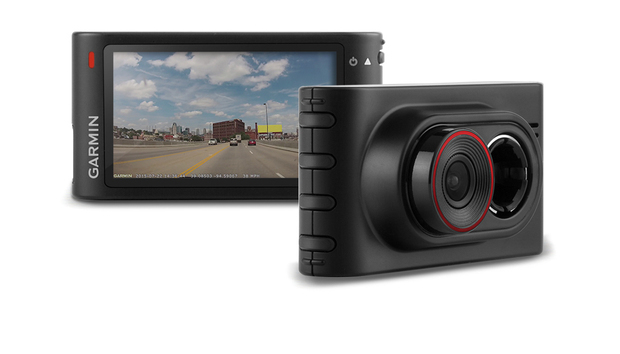 The Dash Cam 35 offers red-light and collision warnings, but no lane-departure warning. Of course, if you really need any of those, we invite you to ride a bicycle instead. Even on a gray day, the Dash Cam 35 delivered great daytime video. Also unlike the DriveAssist 50LMT, with its hefty suction mount, the Dash Cam 35 uses semi-permanent adhesive. You’ll want to be very careful placing and aligning said cup-and ball-mount, as the adhesive is very sticky. You’re also told to let the connection cure for 24 hours before attaching the camera. Garmin’s Dash Cam 35 delivers the clear night video that the company’s DriveAssist 50 doesn’t. On the other hand, the Dash Cam 35’s performance makes our caveats seems trivial. Day and night video are marvelous, every bit as good as the Cobra CDR895D’s and the Thinkware F770’s. That includes reduction of headlight lens flare. With less stylish, more functional buttons, and a slightly lower price, this camera would have pulled another half star.